Yarborough showed off his power early by throwing Hackney through the door and out of the cage. However, the big man looked like he was chewing gum, and he ran out of gas quickly. Hackney dropped him with a punch and added more punches on the ground to win by TKO. Yarborough and the other first-round losers walked away with $1,000. The first-round winners were guaranteed at least $5,000. So between Yarborough and Telia Tuli (UFC 1), it’s looking like we can eliminate “sumo wrestling” from contention as the best fighting style on the planet. Ken Shamrock lost to Gracie in the semifinals of UFC 1, and he would have been back at UFC 2 if it weren’t for a wrist injury. Leninger was a 10-time Arizona judo champ and the No. 2 ranked judoka in the U.S. in his weight class. Shamrock opened with a takedown and Leninger pulled guard. Shamrock took the back, transitioned to the top and delivered some strong punches. Tired of being used as a punching bag and sensing there was no way out, Leninger tapped at the five-minute mark. Payne got a huge ovation from his hometown fans in Charlotte. Howard and his crew represented Canada. Kilmeade pointed out that the Canadians came out in the “Gracie train” formation. Jim Brown said the train originated with boxers like Joe Frazier and Muhammad Ali. Howard dropped Payne on his head, but Payne gamely popped up and started throwing some kicks. Howard won the brawl with a devastating right, and Payne was out on the way to the canvas. Kimo made it clear that he was here to fight and spread the gospel of Jesus Christ. Not only did have Jesus’ Name tattooed on his abdomen, but he had a giant tattoo of the crucified Christ on his back. 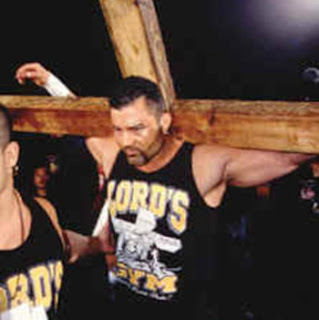 Kimo came out with a giant cross on his back and wrapped up his entrance by Tebowing! So all this time, we should have called it Kimoing. Gracie came out to a massive cheer, as the crowd knew him and gave him total respect for dominating the first two UFC tournaments. Gracie couldn’t take Kimo down for the first 90 seconds. Finally, both men went down and Kimo took Gracie’s back. Royce fought his way to the top, but Kimo BUCKED him off and landed on top. Okay, now we’ve got a fight. Kimo passed his guard and smothered Gracie, which is what Royce always loved to do. Gracie responded by using Kimo’s hair as a handle (There are no rules!). Unfortunately, the injury bug bit the winners of the first four fights really hard. First, Hackney dropped out, and Felix Lee Mitchell took his place on 10 minutes notice. Mitchell came to the ring wearing boxing gloves, but he decided to take them off before the fight. “Good idea,” said Art Jimmerson, watching at home. Lots of close-quarters fighting wore out both men and the crowd. Finally, Shamrock put Mitchell away at the 4:30 mark with the rear naked choke. Shamrock guaranteed himself at least $15,000 with his semifinal victory. The announcers talk about how banged up Gracie is from the first fight. Sure enough, the towel came flying in and Gracie left the tournament with a shoulder injury. Just like that, Gracie’s streak was over. The finals were a big problem, as Shamrock was also unable to compete due to an injury. Steve Jennum, an alternate, jumped right into the final fight. Howard tried a big flip that completely missed before landing a hard right hand. Jennum rebounded by working Howard into the mount position. He ground-and-pounded his way to victory, winning the whole tournament. Jennum, the pride of Omaha, Neb., was busted open from that first big punch, but he was the winner. Promoter Art Davie wrote “Steve Jennum!” on the check, and that’s a wrap!